By David Shear--Now that’s how you do a Jew-do! On Saturday night United Jewish Appeal of Greater Toronto (UJA) hosted its inaugural TOgether party at Toronto’s Royal Ontario Museum. The party brought together approximately 800 of Toronto’s youngest and finest for what turned out to be a wonderfully fun event, which, when discussing Jewish parties, is not at all commonplace. Toronto’s Jewish event schedule is packed year around with events and parties, most notably the annual CJPAC Action party and the JNF Future party, both catering to this crowd, but this party eclipsed both of them and renewed my belief in what a Jewish party should be. The party was chaired by Jay Klein, Emily Burnett and Corey Mandell, founder of Mandell Entertainment Group, and was ably assisted by David Goodman, and a number of other talented and dedicated UJA professionals. All aforementioned “Fantastic Four” are up-and-coming leaders in the Jewish community, and, on Saturday, they showed their professional and creative excellence in putting together this truly unique and memorable event. Mandell Entertainment, one of Toronto’s largest corporate and private entertainment providers, hit a home-run with the evening’s entertainment. The evening started with Toronto’s own Maestro Fresh Wes, a nice appetizer on a menu that served a spectacular retro-trip back in time to the golden era of hip-hop. Young MC, Rob Base & DJ E-Z, Sugarhill Gang and Naughty by Nature turned the crowd of 800 into something I’ve yet to see at this type of party before, namely a no holds barred boisterous group, up on stage singing, dancing, truly enjoying themselves and their friends, while celebrating life in Toronto’s remarkable Jewish community. What a strange and far too rare sight. Thanks to the hard work of the chairs and the committee, the TOgether party raised over $100,000 for the UJA annual campaign, money used to help Toronto’s most vulnerable, build Jewish identity and educate the next generation, and to support Israel and the Jewish world. 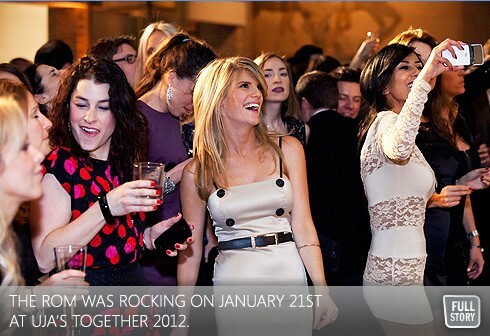 While obviously very early in the year, the bar for hip, fun, unique and meaningful Jewish parties has been set by United Jewish Appeal, with their TOgether firmly entrenched as the front runner for the illustrious title of “Party of the Year”. Now let’s see if the others can rise to the occasion and outdo this one-of-a-kind Jew-do!